President-elect Donald Trump and Vice President-elect Mike Pence wave as they visit to Carrier factory, Thursday, Dec. 1, 2016, in Indianapolis, Ind. 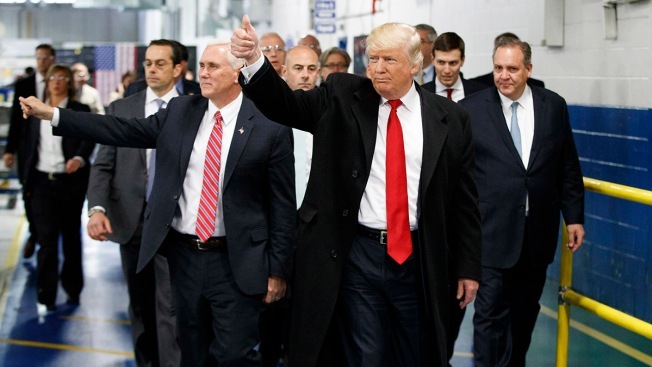 The Carrier factory where then-President-elect Donald Trump announced that he had made a deal to save U.S. jobs from moving to Mexico has started the process of laying off workers. NBC News reports that 338 employees at the Carrier Corporation fan coil manufacturing facility in Indianapolis will be let go Thursday under previously announced plan, the company said in a statement. The positions will be shifted to Mexico, where workers are paid in a day what the Rust Belt employees make in an hour. Trump said in late November 2016 that he had worked out a deal with Carrier to keep 1,100 jobs in the state.